I wasn't sure what to expect from Dying Light, a new open-world zombie game from a studio known for making the regrettable open-world zombie series Dead Island. Imagine my pleasant surprise, then, when I discovered some cool ideas during my first five hours with the game. Maybe you can teach an old zombie new tricks. There are so many things so wrong with Dead Island: Riptide that I’m not even sure where to begin. Maybe. I'm still not sure yet. Dying Light improves aspects of Dead Island's zombie-centric gameplay by adding parkour-style movement into the mix along with other promising features. It doesn't do as much to repair other parts of the Dead Island template that really needed fixing, though. So while I've enjoyed my first few hours with Techland's latest zombie romp, I remain wary about what's going to come next. There's A Story. It Doesn't Seem Very Good. 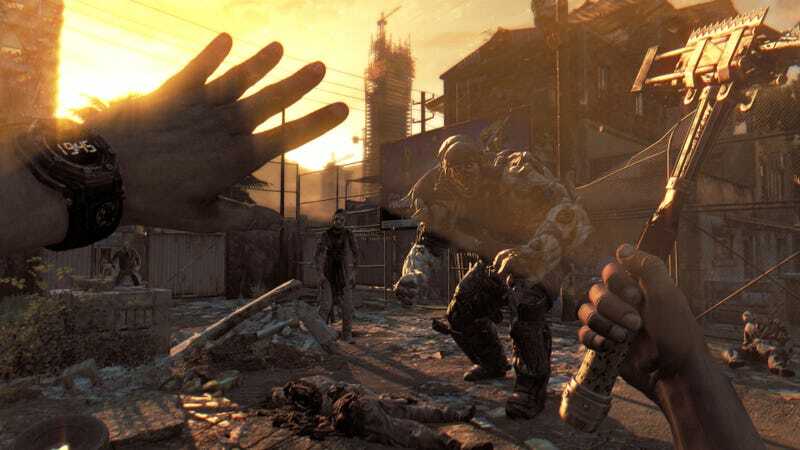 Dying Light is a post-apocalyptic zombie game. There are a lot of those already, so games that are firmly entrenched in the genre don't have to try very hard to establish a premise for their zombie-killing action. At first blush, I'd say that it's safe to put Dying Light in the group that doesn't try very hard. The game takes place in Harran, a city in Turkey that's been put under quarantine due to a virus that turned most of the population into undead flesh-hungry monsters. You're cast as a man named Kyle Crane, an undercover operative who's been dropped into the region to pursue a secret objective. I'm not entirely sure what Crane's mission is yet, but a few key plot points have already started to emerge. There's a relatively ragtag group of survivors and resistance-style fighters you meet at the outset of the game. You help them complete standard zombie apocalypse tasks: gathering supplies, finding medicine, fortifying defenses around the city. Then there's a military despot type guy named Rais "Kadir" Sulaiman who's on uneasy terms with the first group. So...bickering factions, plus the whole secret agent thing. And the zombies, of course, who don't get along with anybody but themselves. In other words: Dying Light is peak zombie apocalypse in a thoroughly routine sense. All of Crane's relationships are purely functional ones that exist as reasons to give the player stuff to do. Narrative conflicts operate on the impersonal level of an abstract political struggle riddled with conspiracy theory logic about viruses, spies, and secret weapons. The game hasn't tried to tug at my heartstrings like, say, The Last of Us did with its zombie fiction. I don't really expect it to either. People who played either of Techland's Dead Island games will find Dying Light very similar. It seems like a sequel. The main difference between Dying Light and the two Dead Islands so far is that the former sticks you with a single character, rather than letting you choose between a few different ones. Damn. For a secret agent, Crane's not in very good shape! After whacking one zombie a few times, he'd need a moment to catch his breath. And a few seconds of Crane gasping heavily was all his zombies foes needed to start chomping on the poor guy. I quickly realized that meeting most of Dying Light's challenges head-on wasn't the best way to go. Better to find another way around the undead, which leads to my favorite part of the new game so far. 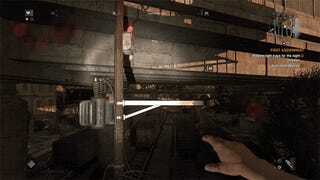 One of the main novelties that Dying Light offers to distinguish itself from Dead Island is the type of movement Crane has available to him. He can perform a number of acrobatic feats while travelling around Harran: jumping between rooftops, climbing up and around buildings, or just running and sliding with athletic grace. I've only unlocked two additional movement abilities, so I expect the game to keep evolving as I gain access to more of Crane's moves. So far, though, I've been pleasantly surprised by how much they add to Dying Light's gameplay. The parkour isn't as distinctive as the unique traversal mechanics in last year's Sunset Overdrive, but it still manages to liven up zombie-centric gameplay that would otherwise be unremarkable at this point. Parkour works similarly to the way it does in games like Assassin's Creed or Shadow of Mordor. This introduces a healthy dose of platforming mechanics that I've normally associated with third-person games, but work impressively well with Dying Light's other first-person actions. It was the first of many. I've spent a lot of time scrambling up walls or climbing on top of cars to avoid deadly packs of zombies. Pragmatically, it's nice to be able to make a quick exit like this. But Dying Light's parkour does more than just that. It makes navigating Harran's dense, vertiginous urban infrastructure refreshingly intriguing. So while the game's setting is mostly uninspired zombie fare so far, it's still proving a fun place to move around in. 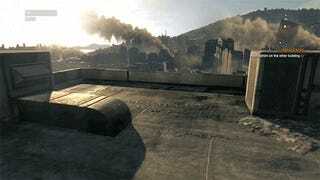 Dying Light's other major gameplay conceit is a day-night cycle on which the city of Harran operates. During the day, things are more traditional and Dead Island-like. Zombies of various shapes and sizes wander around the open-world and attack you if you get too close to them. The game's mini-map marks Harran's super-zombies with vision cones, so evading them works similarly to a stealth game. There's even a short window of opportunity to slink back into the shadows after one notices you. If you don't escape in time, the monsters go into alert, which reminds me of GTA V's cop chases except with zombies instead of police: all the bad guys in the immediate area attack you, and the best way to survive is to run to the closest safe house. You can also outfit your flashlight with a UV light that damages the nocturnal foes, but this has only helped stall them to date. So far, Dying Light has been much more about flight than fight, and that's how I like it. I've had a great time trying to survive in Harran over the course of my first few hours with Dying Light. But I can also tell that there's a lot more to come. And I mean a lot. 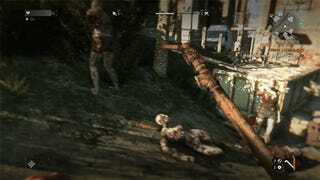 Techland claims that the game offers more than 50 hours of gameplay. Looking ahead to the prospect of spending another 45 hours inside of Harran is more than a little daunting. I don't mean that as a compliment. Not yet, at least. The beginnings were my favorite parts of Dead Island and its sequel, because they were the most interesting sections of the games. You start out with a limited repertoire of skills and weapons available to you, the scarcity of which makes fighting or fleeing from a seemingly endless sea of zombies challenging. Since it was challenging, it was also genuinely frightening—as any a zombie confrontation should be. The problem with Dead Island and Riptide is what came next: after you'd leveled up enough of your skills and acquired enough weapons, making it through the endless sea of zombies became less of a challenge. Since they weren't able to offer new challenges in turn, the invigorating "fight or flight" dynamic in each game was replaced by hours and hours of bland, repetitive zombie-killing. "Endless" became less of a statement of hyperbolic fear, and more one of profound boredom. These games were deeply in love with their own content to such a degree that they lost sight of its value for the experience at hand. Which was a damn shame, because Dead Island always felt like one of those games that came so close to getting things right. If only the developers had learned to better edit their own work and excise the regrettable bloat. I have no idea if Dying Light will end up falling into the same trap as Dead Island did. But I've already picked up on enough similarities between the two to see that, at the very least, it runs the risk of doing so. I'll continue to play and report on Dying Light in the coming days. I plan to have a full review, including impressions of the game's multiplayer modes, sometime in the next few weeks.